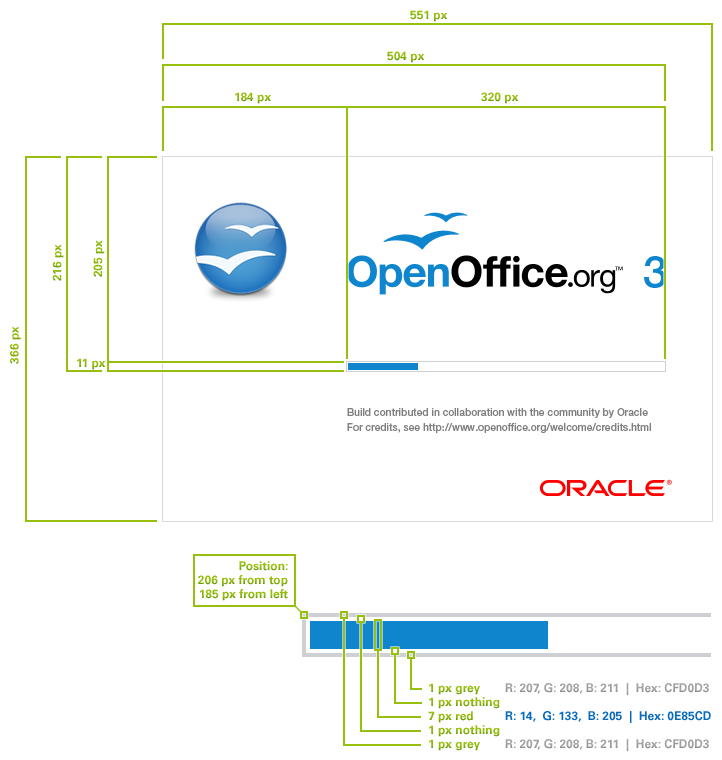 Please note: The refresh of OpenOffice.org is still in progress! Logo redesign in 2010. Please have a look at trademark notes. New Symbol for OpenOffice.org. Please have a look at trademark notes. New Blue for OpenOffice.org. Blue ist Open. Splash Screen Refresh Design in 2010. Please have a look at Branding Initiative, too. Aboubox Refresh Design in 2010. Start Center Refresh Design in 2010. For native Windows Installer: use the 8-bit color depth bitmap "install_OOorg3_standard.bmp" for the product. For Download Installer: use the 8-bit color depth bitmap "install_OOorg3_download.bmp" for the product. For Transformation Wizard: use the 8-bit color depth bitmap "install_OOorg3_transformation.bmp" for the product. For native Windows Installer: use the 8-bit color depth bitmap "banner_OOorg_standard.bmp" for the product. For Download Installer: use the 8-bit color depth bitmap "banner_OOorg3_download.bmp" for the product. For Linux Installer: use the bitmap "OOo3_refresh_linux.gif" for the product. For Mac Installer: use the bitmap "OOo3_refresh_mac_install_image.png" for the product.